This post, written in collaboration with Kim Nooij of Fruits of Thought, dives deeper into one corner of the Makere Workshop, which brought “service providers” directly into the mix. The idea was for teams to rapidly get a sense of the challenges of real life urban problems, brainstorm ways that maps and reporting tools could improve processes, and design a map and process with a close look at real implementation. Umeme Ltd is the biggest energy supplier in Uganda with national coverage (excepting Northwest of Uganda), directly providing power to consumers, downstream of energy producers. This means they take the full force of public frustration when there’s a problem anywhere in the system. They deal with issues like power theft and old decaying power poles, billing complexities, and challenging customer service. Makindye Division is one of the 5 divisions in Kampala with approximately 600,000 residents. One main issue is sanitation: cleaning trenches, collecting garbage and emptying public toilets in the informal settlements. Lack of adequate sanitation has led to malaria outbreaks, and citizens have no option but to dump trash clandestinely at night. Structures are constructed at night, encroaching on land set aside for dumping. National Water & Sewerage Corporation, providing services nationwide in Uganda, are held responsible clean water, but without clear development plans from Kampala and other cities, it’s unclear where infrastructure investments should be made. 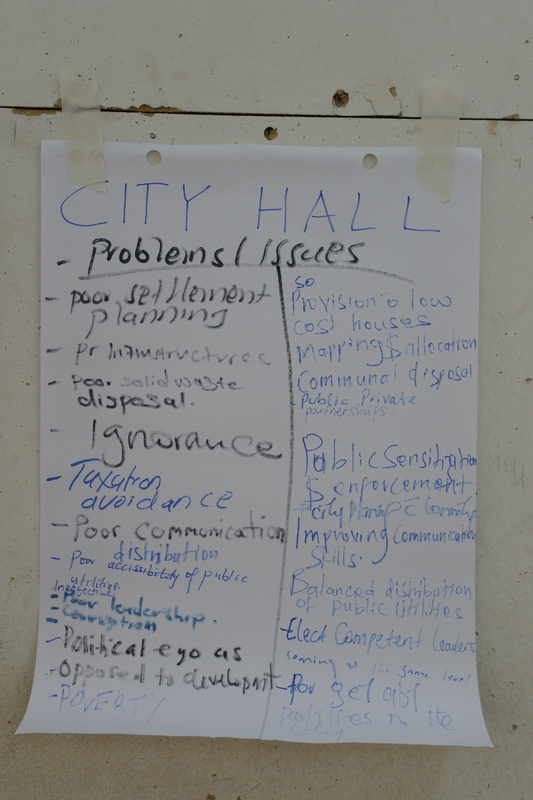 They want to connect the 37 informal settlements in Kampala, but don’t know where they are, how many people live there, or what services they already consume. Coordination with other service providers is lacking, yet they’re all interconnected. Women in Uganda Network (Wougnet) suports women’s groups, with one focus on the accessibility of health facilities and medical services. It’s often not known what services are in which place, or whether drugs or doctors are available. There’s much to improve in connected the right services to patients. Finally, Kepha Ngito. 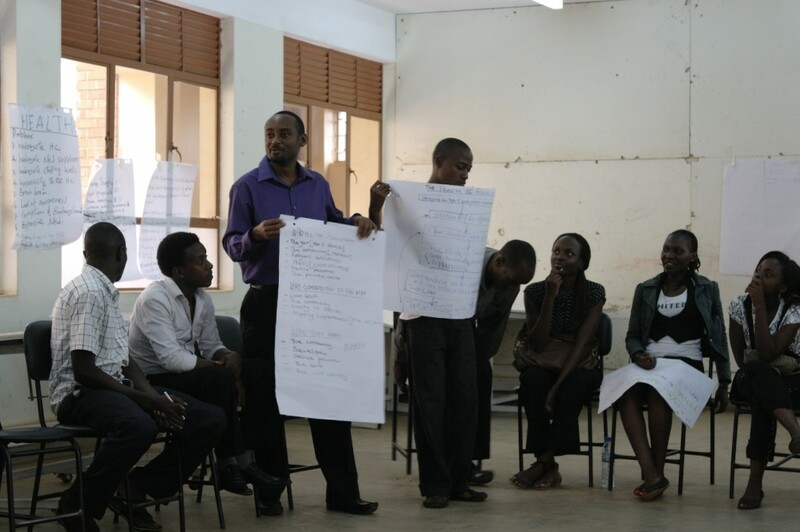 Executive Director of Map Kibera Trust brought out some of the challenges directly facing residents of informal settlements, who have difficulty coordinating and prioritizing needs for the community, and effectively engaging with service providers and authorities. Who contributes to the map? Who uses the map during the process? For us facilitators, it was fascinating to bounce from one group to the next, sampling the different directions and tenor of discussions. In part due to the personalities of the service provider and students, in part due to the nature of the issue, the discussions ranged from somewhat top-down, to participation among everyone, to even a bit contentious. And that was totally all right, since in practice you’d see this breadth of group dynamics anywhere. It came time for all the groups to report back. 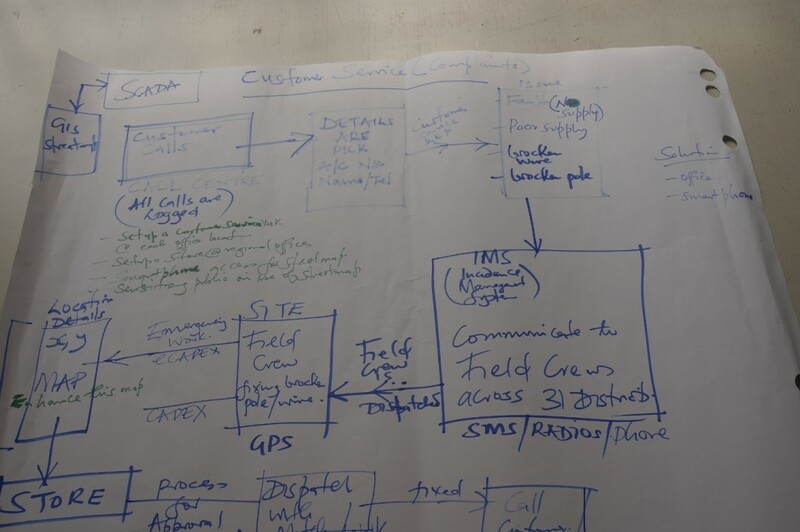 The Umeme team drafted this detailed workflow of how their customers receive feedback of power issues. 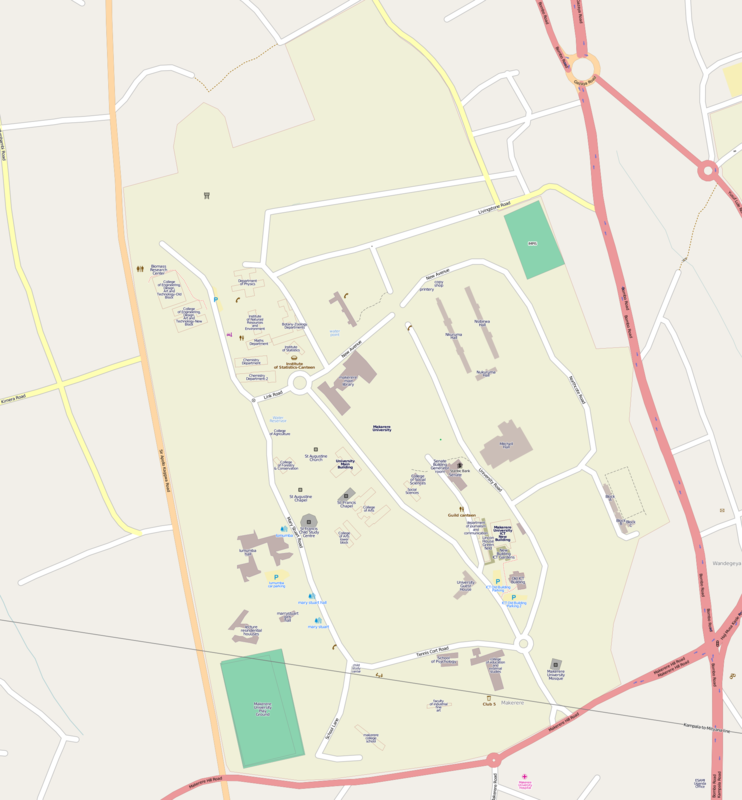 Using map data, customers and problems can be located, and along with time estimates can be shared with customers, both on request when customers call in, or pushed out to areas where problems are happening. 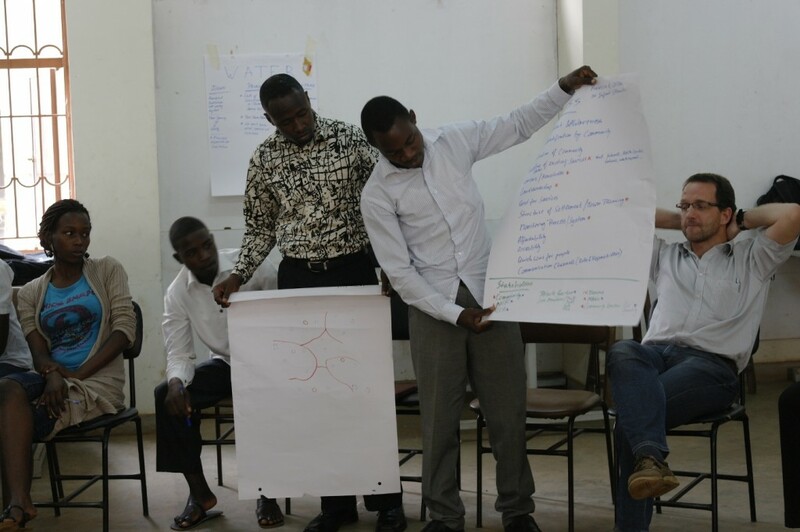 Makindye Division looked at better communication on issues within the community, and more community involvement through partnerships with local organizations and mapping. National Water & Sewerage covered the challenge of coordination, and how maps and data sharing could lead to more cooperation between service providers. 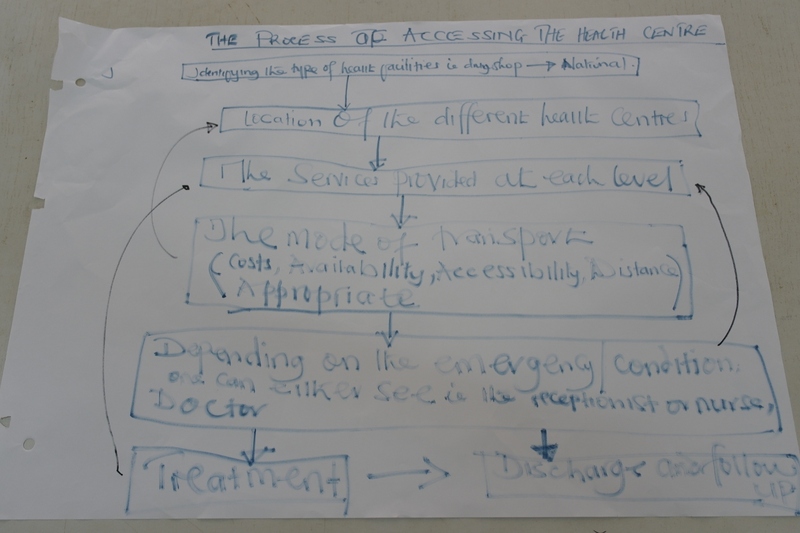 The Wougnet team focused on access to health facilities, and the difficulty of receiving treatment when the only choice is long travel to several health centres to find where the right services are provided. The processes designed looked at increasing public awareness about the supply of drugs and services provided in each center through systems to document stock and locations. Finally, the Kibera team talked about mapping and reporting tools deployed into the community … sounds familiar. It was a really engaging morning, and while we didn’t crack the ultimate solution to any of these challenges, I think everyone came away with a better understanding of the challenges these service providers face, and some of the potential ways to address these issues with not only technology like maps and reporting, but consideration for how such tools fit into the entire system. 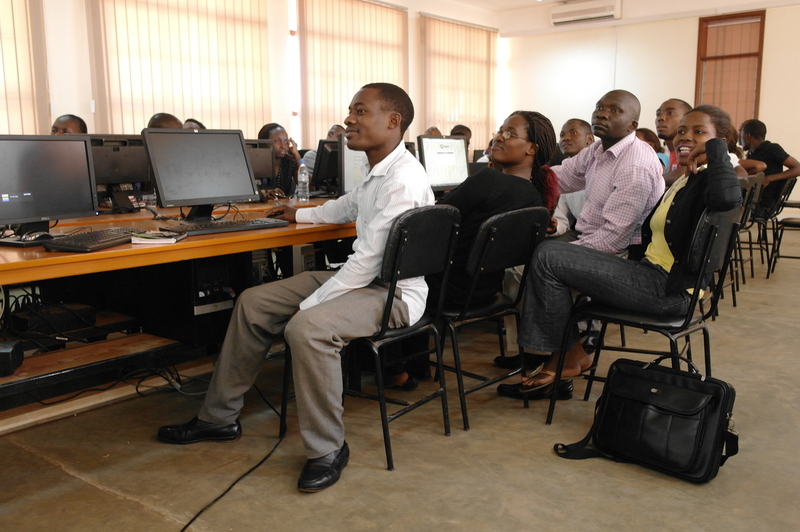 From here, we’re hoping that the pieces come together soon for this practical learning to continue at Makerere. More to come. 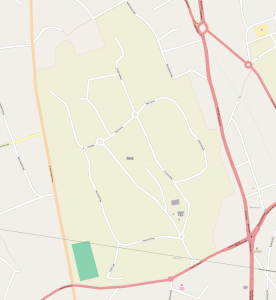 June and the first part of July has had GroundTruth pinging through East Africa … the capitals of Dar es Salaam, Kampala and now Nairobi. We’ve met to help figure out the shape of future projects, held workshops with slum-dwellers students and government-staff, attended conferences, checked in with old friends and probably met hundreds of people. Was so nice to link together the mapping communities throughout the region, and note how each is developing in its unique way. 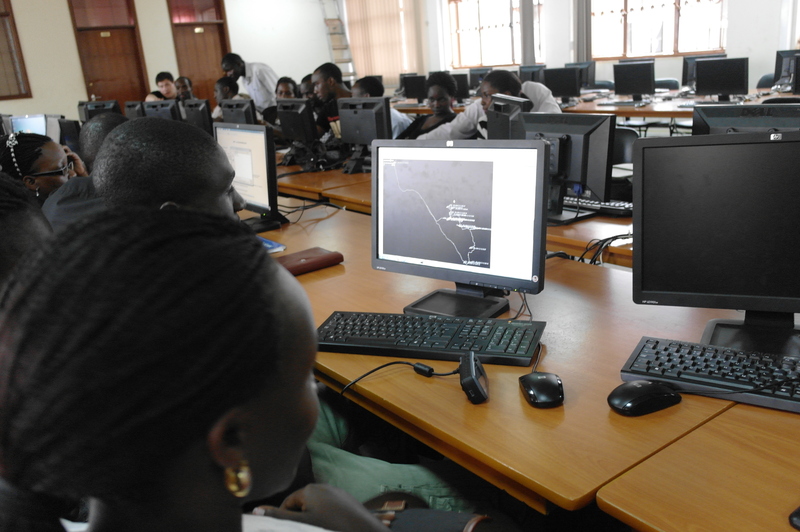 This post focuses on the middle part of the trip, which revolved around a two day mapping and reporting workshop at Makerere University in Kampala. The workshop brought together 20 first year urban planning students from Makerere, eager to gain new skills in real world situations; and 8 staff from the Ministry of Lands, Housing and Urban Development, who are looking to see how community generated information can help inform larger programs. 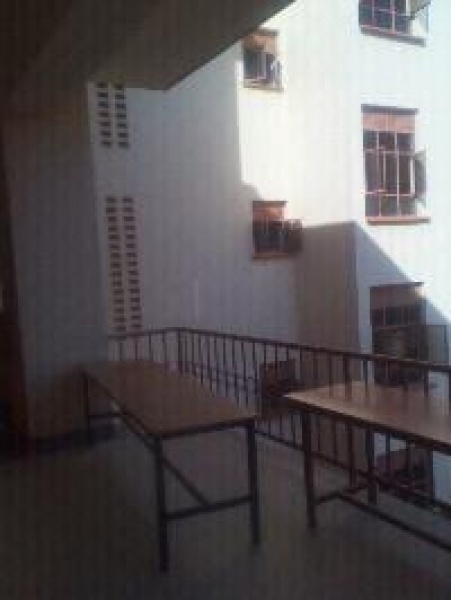 All was held in the remarkably good and spacious facilities at Makerere. More on what shape this all can possibly take hopefully soon, we’re waiting to hear more. Day 1 was very familiar territory for all of us. The goal was to bring the group through the entire process of OSM, and this went pretty much as well as you could ever expect. Not unexpected that this would be a sharp group. Here’s the before and after. But before all that, we wanted to set the space, and emphasize this was the participants’s workshop, with their responsibility to guide it themselves in order to get what they want out of it. Took a few tricks from the epic facilitator Gunner, especially from the useful Facilitation Wiki, and threw in some of our own tricks. Of course Opening Circle, with quick 3 part introduction (name, affiliation, mood in one word). And to warm up our voices we went with “What was your first experience with a computer?”, which is always interesting, and in this case clustered around a first experience in high school for the Ugandans (who seemed to have had a nicely equipped education), and a bunch of us who first touched a computer before most of the students were born. To get moving, we “mapped with our feet”, mapping out our home cities by placing ourselves around the room, and then set up mapping groups by bringing together someone each from the SW, SE, NE, NW of Uganda. 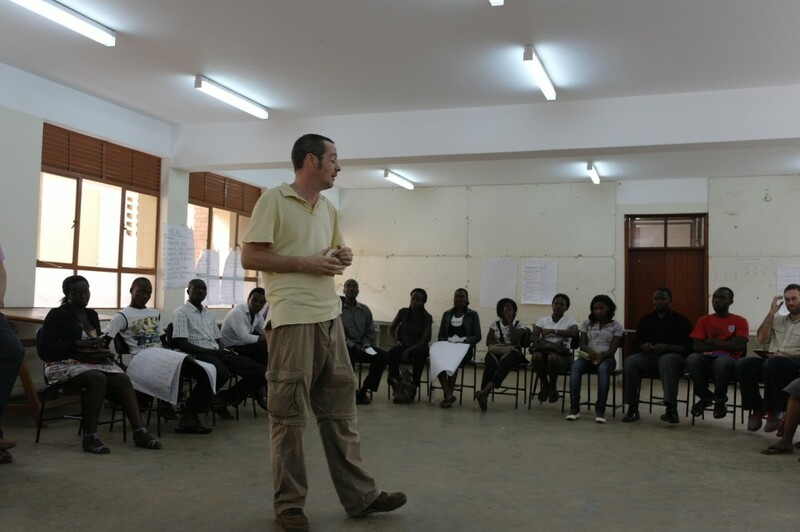 All I know is facilitation is hard, and since then I have studied keenly how the events in Nairobi, ODDC and Global Voices, pulled together creative spaces. Got some good feedback at the end of the first day. We should have emailed out some advance notice of the order of the day and the requirements, and started the discussion of what everyone was hoping to get from the event (yes, read that too late in the Facilitation Wiki). Handouts would be helpful (or at least advance link to LearnOSM). And when we divided the mapping pie, the participants asked for more clear guidance on which areas they should map, because groups ended up overlapping. GroundTruth usually leaves this admittedly confusing step to the participants, because thinking through this and debating with each other is a great way to warm up the geographic collaboration; perhaps we need to think more on how to guide this step better. Day 2 opened with so much, we’re going to cover that in an upcoming guest post by Kim from Fruits of Thought. In the afternoon, we dove into reporting. Erica led a discussion on why community reporting is important and the role it plays in engagement, empowerment, and connection; what kinds of things to report; the spectrum of kinds of reports in traditional and social medial; and how to report. 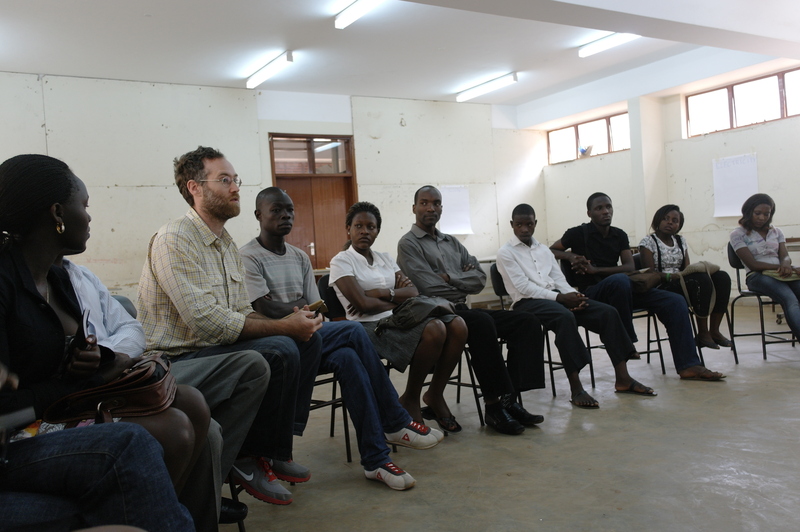 For a workshop, one of the easiest ways to get rolling is setting up a Crowdmap instance, Makerere 2012, so we went upstairs into lab for a demo of Ushahidi, and examples from Kenya and Tanzania. 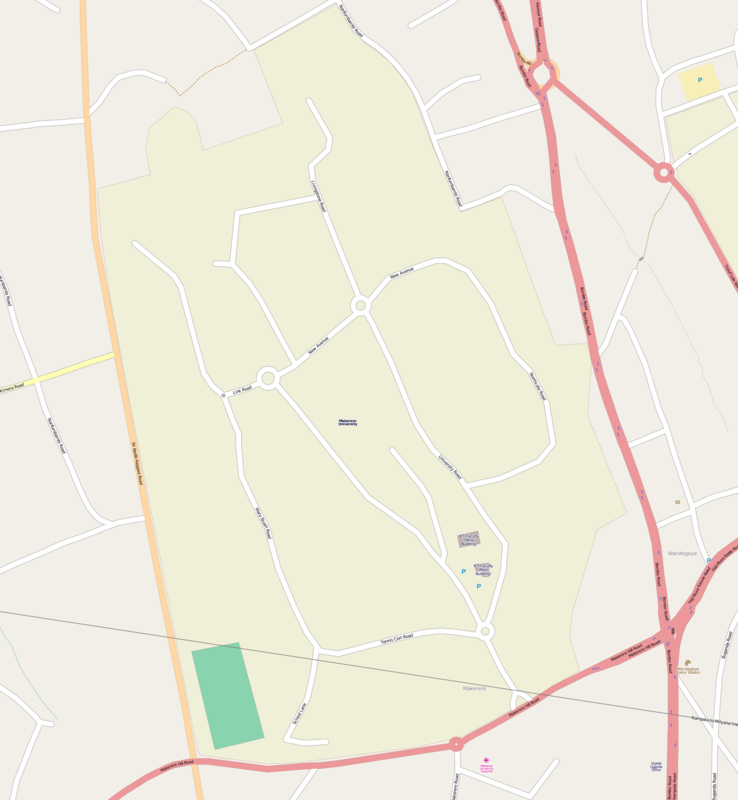 The groups that formed yesterday for mapping came together again to produce at least one story on Ushahidi, combining text, images, and the location on the map they created the day before. The focus: their community, the University, and what kinds of things needed attention. The lab really started buzzing. After an hour after concerted effort, the groups started presenting back their reports. … including some feedback on the workshop itself! Afternoon Tea Break Missing on Day 2 was an aweseom sly joke but great example of what’s possible with public feedback. The tea break was missing on day 2, and some complained, and photographed the empty tea table, but through the process of reporting learned that it was democratically voted on. Myself, the “service provider”, was able to get in and comment, and encourage them to speak up more in democratic processes! I also learned, even if no one is taking tea enthusiastically (like on day 1), never a good idea to skip the tea! And on that note, a shout out to the Food Science Kitchen at Makerere, who fed us well over the two days. 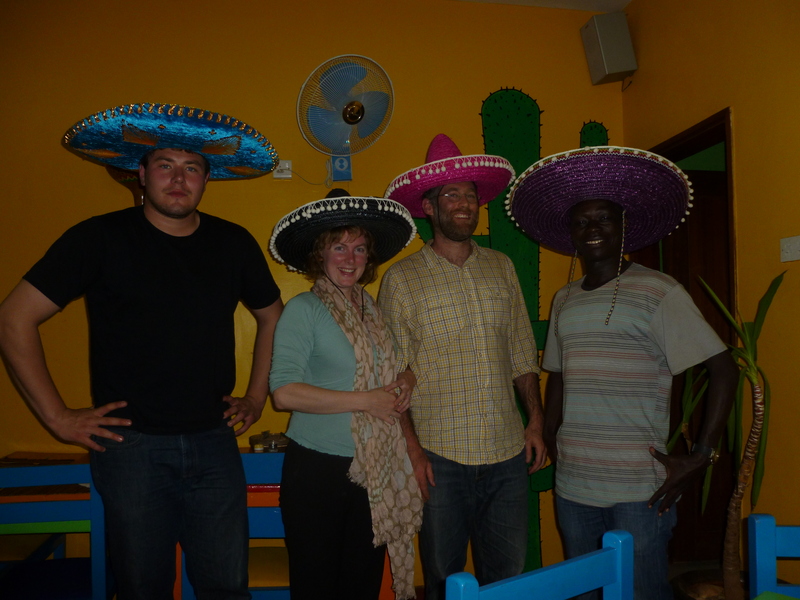 And a super wow to the Little Donkey, the Kampala based social enterprise serving the best and most suprising Mexican food I’ve had outside of North America. 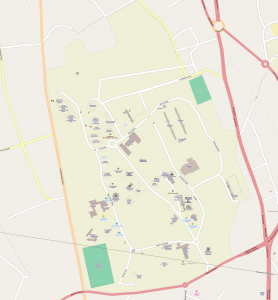 They also house s7 computer school, which hosts regular mapping workshops. Wow. My euphoria was aided by an epic boda boda ride right across Kampala with my life intact.